Born in Germany but reared on an Iowa farm, Erich gave up tractors to obtain a degree in biology, tour South Vietnam on helicopters and armored personnel carriers, and earn a PhD in immunology. Shortly after a research position brought him to the Pacific Northwest, he began to spend more time away from the lab and acquired a greater interest in exploring hiking trails and his family history than esoteric aspects of the immune response. A subsequent journalism degree, the stories he’d collected from his parents and others, and multiple trips to Europe in pursuit of interviews, records, and history propelled him to piece together the nonfiction narrative he found himself charged with. 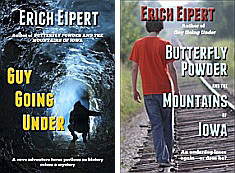 When not writing, Erich coaches vision-impaired athletes in the sport of goalball, spends time with his grandsons, and still pounds out the miles hiking the mountains and deserts of the great American West. I entered the world in the place my parents met—Bavaria. They’d settled in this southeast corner of Germany when millions of Central and East European ethnic Germans like them were expelled from their homes at the close of World War II. However, the two tongues spoken in Bavaria, German and a nearly-unrecognizable-as-German dialect, are today a faint memory for me because shortly before I began school my family left war-ravished Germany behind. My new home required learning only one language to replace the other two, but the remote and dusty location in California was too lonely and alien for my parents. Before long they transplanted their brood to southeast Iowa where the farming and climate were more to their liking. During my formative years there, I probably spent too much time on the seat of a tractor because the many hours of slow, repetitive travel up and down long fields caused me to ponder life and make observations that seemed to belong in books. Following an indecently short interval after garnering a biology degree from St. Ambrose College in Davenport, Iowa, my local draft board chose to further my physical education. In my new name-personalized, olive-drab wardrobe I became even more intimately acquainted with the ground than through farming. Before I knew it, rough-mannered men with stripes on their sleeves pronounced me qualified for an all-expenses paid trip to yet another southeast place—Southeast Asia—in care of the 25th Infantry Division. I returned mostly in one piece lugging a combat infantry badge, a purple heart, and an altered perspective. In the following years I married, cadged a PhD in immunology from Michigan State University, completed a stint as a postdoctoral fellow at UCLA, and began a research program in a National Marine Fisheries Service lab in Seattle, Washington. However, because my military experience instilled me with a need for a boss-free environment, I discarded my lab coat to help raise two children and pursue various solo endeavors. Eventually, the writing infection of long ago emerged to become both a passion and a curse. I never quite knew which applied when, and often still don’t.